Plan4Health connects communities across the country, funding work at the intersection of planning and public health. Anchored by American Planning Association (APA) chapters and American Public Health Association (APHA) affiliates, Plan4Health supports creative partnerships to build sustainable, cross-sector coalitions. The Delaware Plan4Health Team was fortunate to be awarded both a Plan4Health grant and a Planners4Health grant to integrate health in planning. In the Plan4Health project period, Delaware aimed to integrate health and equity considerations into the comprehensive plan updates for the City of Dover and Kent County. During this process, the Delaware team developed mapping tools to identify priority areas for equity in food access, parks/open space, walkability, and bikeability. Often, comprehensive plans do not address the public health impact of planning decisions. However, we know that planning can greatly influence healthy behavior decisions that impact obesity and other chronic diseases, such as heart disease and Type 2 diabetes. Planners have an opportunity to prioritize local planning to improve health status and health outcomes. 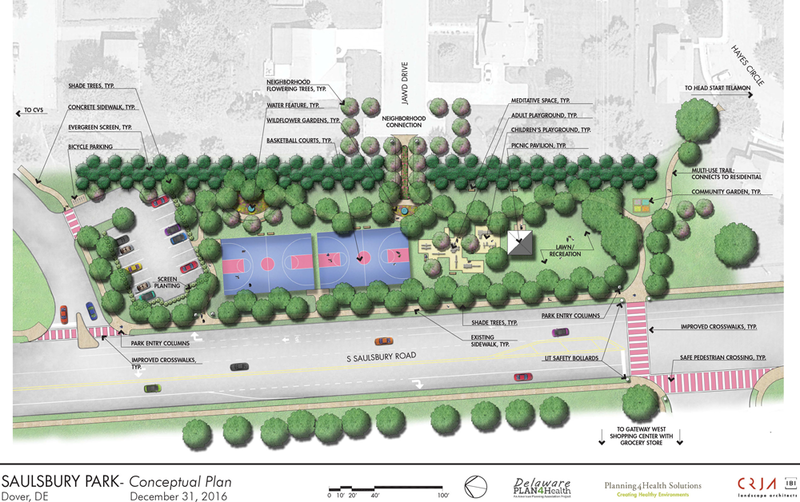 Conceptual plan of Saulsbury Park developed through Plan4Health. Image courtesy Plan4Health Delaware. 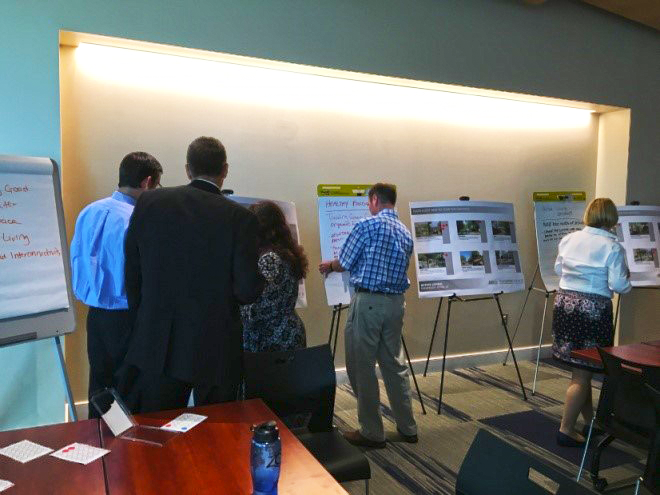 The Kent County and City of Dover comprehensive plan update efforts were well received, and it was recommended to expand the mapping statewide and present the findings to stakeholders from diverse disciplines. The timing of the Planners4Health grant allowed the Plan4Health team to go immediately to this next step. At the statewide roundtable for Planners4Health, the state maps for health and equity were presented. The roundtable provided stakeholders and partners with a tool to identify areas for interventions, including changes in infrastructure. In addition, advocates see the maps as tools to communicate and raise awareness for equitable solutions for food access, parks and recreation, and transportation. Community members at the Delaware charrette. Image courtesy Plan4Health Delaware. “The A’s of Influencing Health Eating and Active Living” was authored by Michelle Eichinger, MS, MPA. “When Planning Meets Health: Delaware’s Plan4Health Grant Fosters a Healthy Delaware” was co-authored by Michelle Eichinger, Kristen Vales, David Edgell, Tim Gibbs, Bill Swiatek, Patti Miller, and Mary Ellen Gray. Read the "Proceedings from the Planners4Health Roundtable Summit," May 2017. Read "Guidance for Incorporating Health into Kent County’s Comprehensive Plan," October 2017. Top image: Rendering of Felton East bicycle network enlargement from Kent County, Delaware, Comprehensive Plan Guidance, 2016. Image from "Guidance for Incorporating Health into Kent County’s Comprehensive Plan" by Delaware Plan4Health. Michelle Eichinger is president of Planning4Health Solutions and a doctoral student at Clemson University.